This is the question Craig Schonegevel’s brave life and death challenge us to ask of ourselves and the society we live in. Is it humane to deny those who suffer from an incurable or life-threatning illness the right to a dignified death? THE LAST RIGHT (by award-winning Marianne Thamm and published by Jacana) is the true story of how one Port Elizabeth family, their friends and the community they live in, were forced to deal with one of life’s most devastating events – the dying and death of a loved-one. Each role player in Craig’s journey to self-deliverance faced monumental ethical, moral and spiritual questions. 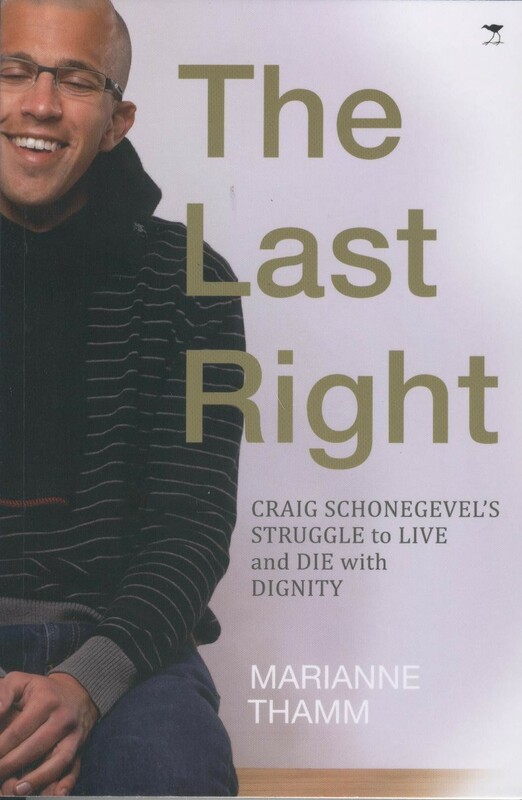 The book is as much their story as it is Craig’s. The book may be purchased at most book shops and online at http://www.takealot.com . Listen here to the discussion on AlgoaFM subsequent to the launching of the book between Lance du Plessis (AlgoaFM presenter), Marianne Thom (author) and Craig’s parents, Neville and Patsy Schonegevel.